July 17, 2014 (Tokyo, Japan) - Japan Display Inc. (President and CEO: Shuichi Otsuka; JDI), a leading global supplier of small- and medium-sized displays, is commencing mass production of "IPS-NEO" for mobile products this July. It has been created through JDI's unique technological development. It has already earned high marks for its high contrast and high image quality favorable to medical and other industrial applications. It will be expanded step by step to other applications. Liquid crystal panel manufacturing requires an orientation process that aligns liquid crystal molecules in a uniform direction. Generally, the rubbing method, as portrayed in the diagram below, is employed. In this process, an orientation membrane is rubbed in a fixed direction with a rubbing roller with cloth wound on it. With this method, unevenness of the circuit pattern formed on the glass substrate could impede proper orientation and the involvement of foreign particles in the rubbing process may affect the production yield. 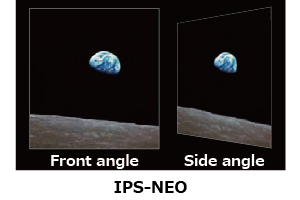 Adopting JDI’s unique photo alignment method, "IPS-NEO" is free from these issues and achieves a higher contrast, superior viewing angle characteristics and an improved production yield. Products adopting high resolution formats have been spreading in recent years. As their pixel sizes are smaller, transmissivity tends to be poorer and backlight power consumption to be higher. 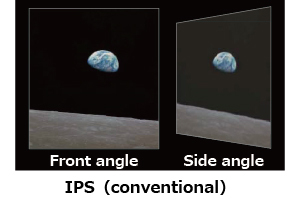 In contrast, JDI's photo alignment method paves the way for the use of highly transmissive liquid crystal, traditionally regarded as difficult to mass produce. That helps increase transmissivity by at least 10% and contributes to reduced power consumption. JDI's sixth-generation (1,500 x 1,850mm glass substrate) low temperature poly-silicon (LTPS) line in its Mobara Plant (Mobara-shi, Chiba, Japan) is now ready for mass production of "IPS-NEO". In the future, JDI will be steadily introducing and expanding it to other lines. "IPS-NEO" is a trademark of Japan Display Inc.